How many times have you been baptized? Scripture talks about baptism — full immersion in water — as a first step in believers’ walks of faith. It’s an outward sign of our identification with God’s people and our commitment to leave our old lives behind. Some church groups stop there, some sprinkle people from a baptismal instead, and Messianics continue to mikvah on a semi-regular basis. Water, spirit, and fire — those are the three baptisms that John tells us believers in Jesus will go through. I think this is what the writer of Hebrews means when he describes “the doctrine of baptisms” (plural) as a foundation of Christianity (Heb. 6:1-2). The baptism of water is the easiest to study. We have multiple examples of it in the gospels and throughout Acts. When someone became a believer in Jesus as the Messiah, they were baptized in His name. It was the next step after repentance as part of their commitment to follow His teachings. Baptism in water acts as a sign that we’re committing to Christ and identifying with His people. It also serves a symbolic purpose that Paul talks about in his letter to the Romans. When we’re baptized, we put our “body of sin” into the grave as if “our old man was crucified with” Jesus (Rom. 6:6). Coming up out of the water aligns you with His resurrection. Now, you’re ready to live a new life as a servant of God. You’re also ready for the next baptism, which gives you what you need to keep following God. 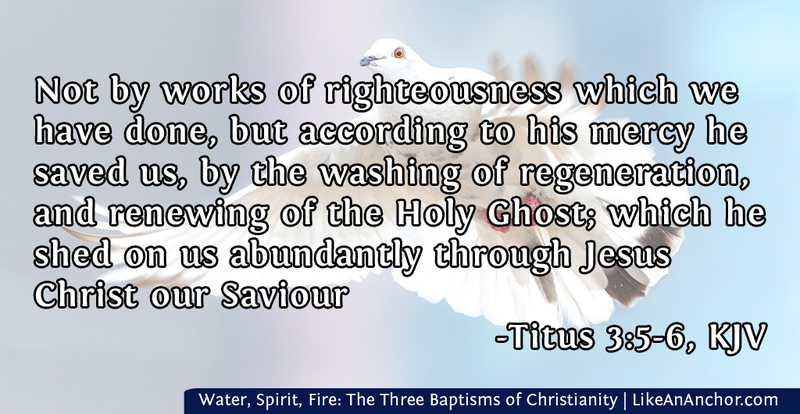 After Christ’s water baptism, the spirit of God descended on Him in the form of a dove (Matt. 3:16). Peter tells us that new believers’ baptisms follow a similar pattern: “Repent, and be baptized, every one of you, in the name of Jesus Christ for the forgiveness of sins, and you will receive the gift of the Holy Spirit” (Acts 2:38, WEB). There are exceptions recorded (Acts 10:44-48), but for most people water baptism is followed by spirit baptism. The spirit of God is a precious gift. It’s God’s mind connecting with our’s making it possible for us to understand spiritual things (1 Cor. 2:9-16). 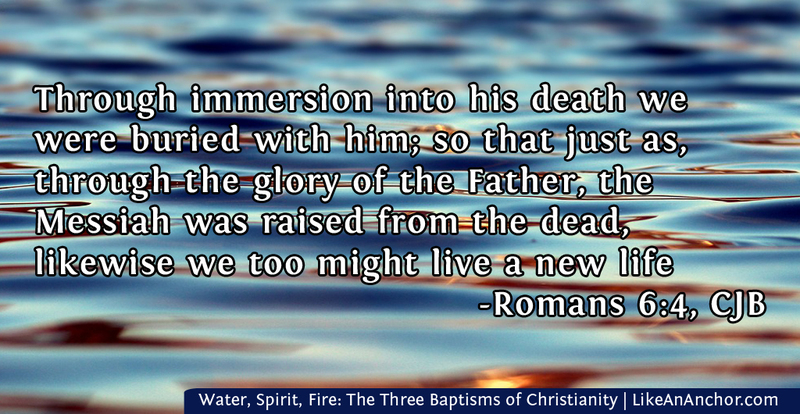 Baptism in water prepares us to walk in newness of life, but it’s baptism of the spirit that actually lets us do that. Once we commit to following God with water baptism, God commits to making us His children with spiritual baptism. We dunk ourselves in water and He washes us with His spirit, beginning a life-long process of us walking in the spirit. Fire in the Bible is often referred to as a refining force. It heats up metal for purification and it burns off wrong things we’re building in our lives. Paul says that fire will reveal what each of us has been building on the foundation, which is Jesus Christ. Sometimes what we’re building comes through the fire intact, passing the test. 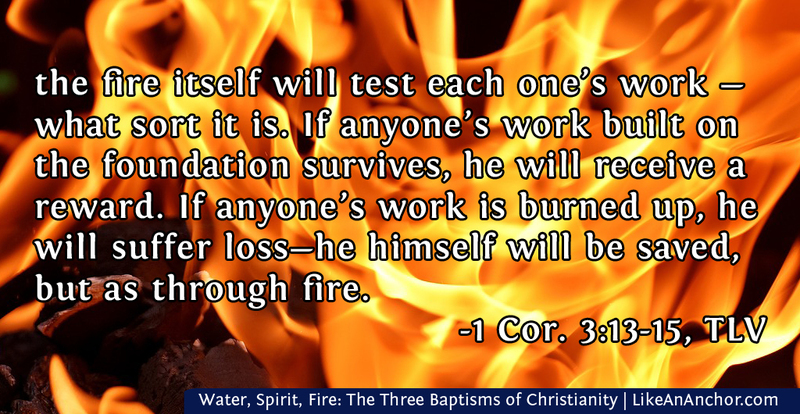 Other times “If any man’s work is burned, he will suffer loss, but he himself will be saved, but as through fire” (1 Cor. 3:10-15). The fire is meant for our good, checking us to make sure we remain in the spirit and building us up to become like Jesus. 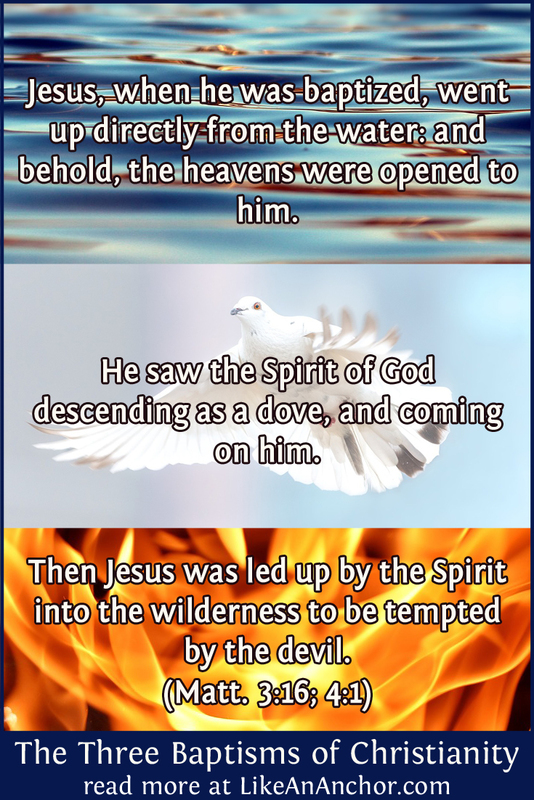 Right after His water and spirit baptisms, “Jesus was led up by the Spirit into the wilderness to be tempted of the devil” (Matt. 4:1, WEB). Like our Savior, we have to face temptations and trials as part of our walk in faith. Like baptism of the spirit, baptism of fire is an ongoing process. Even in the midst of His earthly ministry, Jesus said, “I have a baptism to be baptized with, and how distressed I am until it is accomplished” (Luke 12:50, WEB). We follow in His footsteps, sharing in His sufferings as He refines us. But we also get to share in His spirit and we know that with Jesus as our Baptist the work God is doing in us will have a good outcome. Easter week meditation - rhymi… on Holy Acrostics!